« FLORENCEFEST 2018 – Get your tickets here! 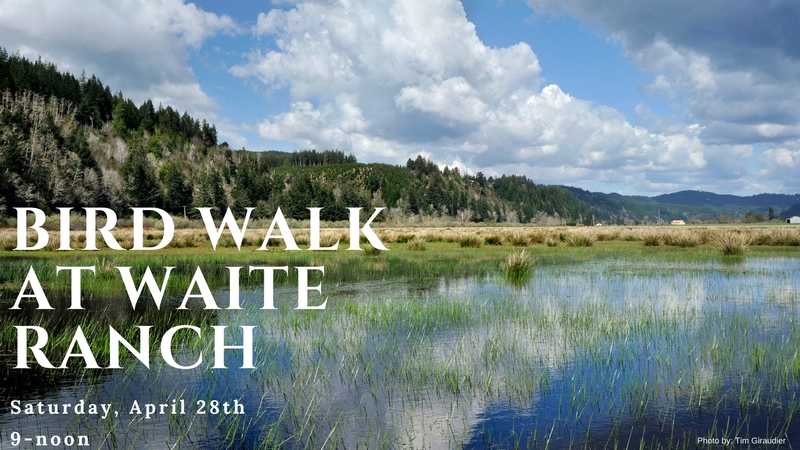 Join McKenzie River Trust and the Siuslaw Watershed Council for a bird walk at Waite Ranch. At the last bird count, 57 species were identified in just three hours! Jim Regali and Alan Contreras will be our ornithology guides for the walk. Waite Ranch is about 3 miles from Florence, just east of the Cushman Bridge between Hwy. 126 and the Siuslaw River. Historically, the property was a tidal estuary made up of mudflats, marsh, tidal swamp, riparian forest, and possibly crabapple swamp (the rarest of estuarine plant communities). The property was homesteaded around the turn of the century when it was diked. It then became a dairy farm. In 2010, McKenzie River Trust (MRT) bought the Waite property. MRT’s intention is to restore it to its historic ecological state as a tidal wetland by re-establishing full tidal exchange to the property. The McKenzie River Trust has partnered with the Siuslaw Watershed Council to manage Waite Ranch’s restoration.